Kingpin Do-Not-Remove Sign. 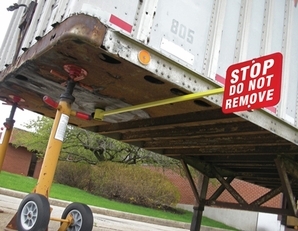 Helps prevent accidental removal of a trailer being worked. Install sign on kingpin after placing trailer jacks. Screw-clamp anchors holder to kingpin. Holder can project from side or from front of trailer. Length 76 in. Sign Plate 12 in. x 15 in. included. Other sign wordings available.